A site-specific exhibition performance by Jeroen Bosch, Jeroen Jongeleen and myself as part of Trendbeheer’s ongoing Trendbeheer presenteert exhibition series. Potrait of an art fair in 150 sales. During the 5 days of Art Amsterdam 2011 we documented ‘every’ sale made by photographing the red sales stickers. In every picture we would center the red dot and scale it it to 8 mm (the standard size of the red sticker), give it a title (included in every picture), print it, frame it and hang it in our booth. At the start of the fair our booth was empty (except for a grid of 300 screws) and by the end of the fair the installation was complete. At the start of the fair, an empty booth. Except for a grid of 300 screws. A few minutes after the opening we spot the first sale of the fair at the Suzanne Biederberg Gallery. All the works in our booth are for sale. Each individual piece edition of 1 + 1 AP, the complete installation is also for sale (also edition of 1). At this moment 79 individual pieces have been sold, 71 pieces are still available. To see which works are still available please take a look at the complete list of the works here: Trendbeheer.com/2011/05/23/for-the-love-of-money-de-werken-2/. They are € 150 each (including VAT, framing and shipping). On the right you can see table where all the photographs were fed into a computer, categorized, scaled, given a title, printed and framed. It also doubled as our cash register. Opening night Art Amsterdam 2011. Carefully choosing three photographs that feature a blank wooden frame in the upper left corner. A real Jan Schoonhoven (Kunsthandel Meijer)! 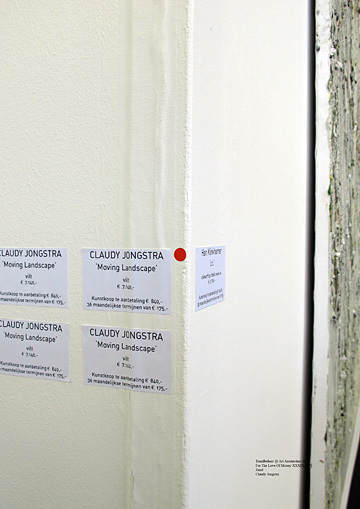 Stickering your purchase (in this is case a wonderful Claudy Jongstra). Almost done, 3 hours before the fair ended, printing the last red sales sticker (bottom right) and filling up the holes left by sold pieces with Artist’s Proofs. For The Love of Money was made and on display during Art Amsterdam 2011 (May 11-15). We would like to thank Herman van Iperen, Jolien Kramer, Johannes Langkamp, Petra van Noort, Esther Kokmeijer, Tineke Brinkhorst, Simon Schrikker, Anouk Griffioen and Martijn Konings for all their help in our booth, technical support and the hunt for red sales stickers.